King Baggot. Printed, semi-glossy arcade card / postcard. Undated, 1920s, issued by Universal Pictures. Handwriting on back reads: "Compliments of the Grand Theatre"; city unknown. King Baggot (b. Nov. 7, 1879; d. July 11, 1948) is most significant to Santa Clarita Valley historians for having directed William S. Hart's final and most famous film, "Tumbleweeds" (1925, re-released 1939). In a broader sense, of course, he was more than that; Baggot was the first individually publicized actor in an American film (the earliest films didn't run actor credits or make a big deal of their stars). Filmmakers capitalized on his name, promoting him as the "King of the Movies." Born in St. Louis, Mo., Baggot made the transition from Shakespearean stage to screen (just like Hart), appearing in at least 269 films from 1909 to 1947 including "The Scarlett Letter" (1911), "Dr. Jekyll and Mr. Hyde" (1913) and "Ivanhoe" (1913). 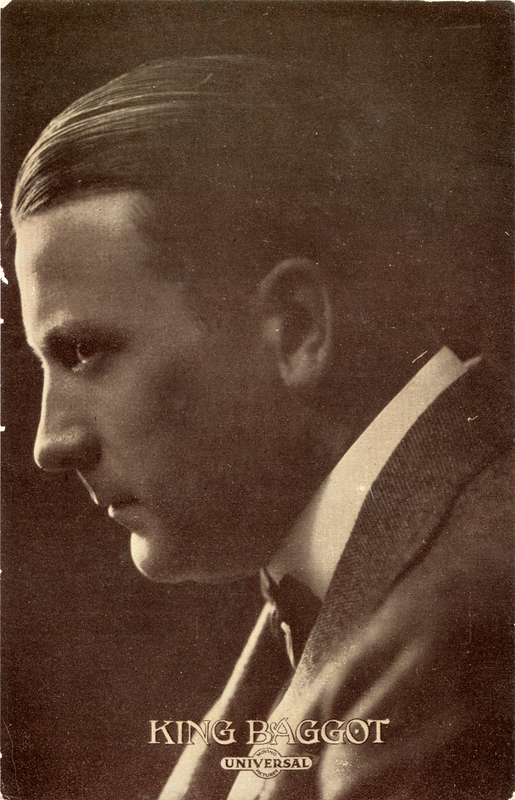 He also wrote scenarios (screenplays) and directed at least 45 films from 1912 to 1928. LW2512a: 19200 dpi jpeg from original card purchased 2012 by Leon Worden.